Each task function of the pipeline is a recipe or rule which can be applied repeatedly to our data. an align_dna() task which will align the DNA of many chromosomes. 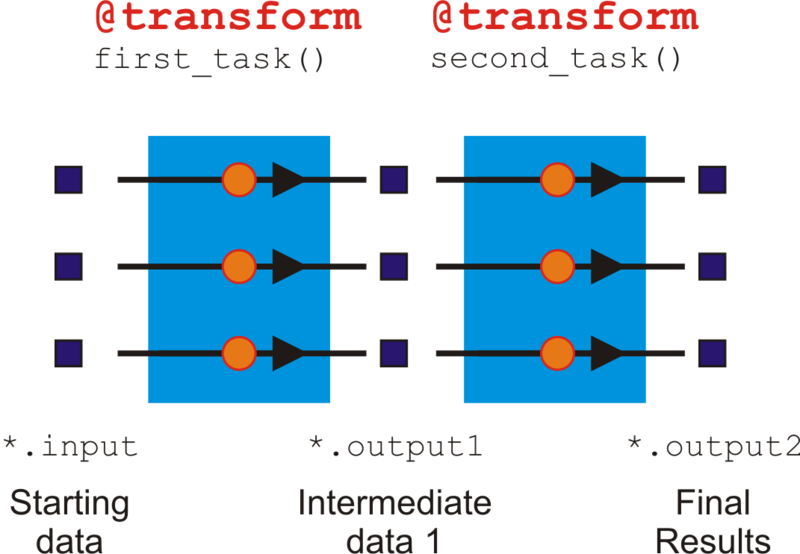 @transform is a 1:1 operation because for each input, it generates one output. This is obvious when you count the number of jobs at each step. In our example pipeline, there are always three jobs moving through in step at each stage (task). Each Input or Output is not limited, however, to a single filename. Each job can accept, for example, a pair of files as its Input, or generate more than one file or a dictionary or numbers as its Output. When each job outputs a pair of files, this does not generate two jobs downstream. It just means that the successive task in the pipeline will receive a list or tuple of files as its input parameter. The different sort of decorators in Ruffus determine the topology of your pipeline, i.e. how the jobs from different tasks are linked together seamlessly. @transform always generates one Output for one Input. In the later parts of the tutorial, we will encounter more decorators which can split up, or join together or group inputs. In other words, using other decorators Input and Output can have many to one, many to many etc. relationships. Let us rewrite our previous example so that the Input of the first task are matching pairs of DNA sequence files, processed in tandem. suffix always matches only the first file name in each Input. Ruffus chains together different tasks by taking the Output from one job and plugging it automatically as the Input of the next. The first two parameters of each job are the Input and Output parameters respectively. Extra parameters are for the consumption of summarise_bam_file() and will not passed to the next task. Nevertheless, all the task parameters can include anything which suits your workflow, from lists of files, to numbers, sets or tuples. Ruffus imposes few constraints on what you would like to send to each stage of your pipeline. Ruffus does, however, assume that if the Input and Output parameter contains strings, these will be interpreted as file names required by and produced by that job. As we shall see, the modification times of these file names indicate whether that part of the pipeline is up to date or needs to be rerun.